You spend a lot of money maintaining your landscaping and the appearance of your home, but you need to consider your tile roof too. Tile roof cleaning will ensure you protect your home from the sun’s harmful rays. Cleaning it is the best way to prevent damage from algae and mold that can grow between tiles. Those growths block water run-off, and if they are bad enough, the water runs under the tiles, causing major damage to your roof. But, tile roof cleaning is not a DIY job. It can be dangerous and, for a thorough cleaning, you need the tools and cleaning solutions available only to professionals. Let Peerless Pressure Washing in Tampa do the work for you whether you are in Tampa, Clearwater, St. Petersburg, Brandon or beyond. We will restore your tile roof with the gentlest methods possible, ensuring its long life. Never uses high-pressure cleaning, so it will not lift, loosen or break tiles. Employs a special pump with a 50-foot reach, enabling us to stay off the tiles, which can break when walked on. Utilizes a special gel formula, Peerless Punch, which is custom-blended for your roof to kill algae and mold. It also sticks to tiles, leaving a residual algaecide for long-term protection. Stations one crew member on the ground to monitor and wash away run-off, guarding against chemical damage to plants, windows and siding. Is approved by the Asphalt Roofing Manufacturers Association and meets the requirements of two major roofing manufacturers, Gaf and Monier, so it will not void your roof warranty. Comes with a one-year guarantee. If moss or algae grows back in the year following our service, we will clean your roof again for free. How long did your last tile roof pressure washing last? Under a year? Or even worse, the roof was more black from the algae spores that were spread during the high pressure water blasting the following mold growing season, leaving you with a bigger problem. The Peerless Punch Tile Roof Cleaning System kills the algae including the spores, resulting in a much longer lasting cleaner roof. We can achieve a total spore kill ratio utilizing our large gallon per minute chemical pumps. This ensures the algae is completely covered and absorbs all of the solution. Contact us today for more information about our tile roof cleaning service. 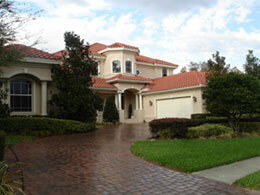 We are happy to serve you in Tampa, Brandon, Lakewood Ranch, West Chase and beyond. We will take commercial jobs all the way to Orlando along the Route 4 corridor.